Dinosaurs populated the planet so long ago it’s hard to fathom such a phenomenon that humans today never personally experienced. We’re not saying we would’ve liked to live among these scaly monsters, but in a way, we are. Dinosaur National Monument Park makes our Jurassic dreams come true, or at least something like them. The park, which celebrates over 100 years since paleontologist Earl Douglass’ discovery of dinosaur fossils, has an impressive collection of colorful and textural rock layers, dinosaur fossils, and a rare population of peregrine falcons that is a feast for the mind and the eye. 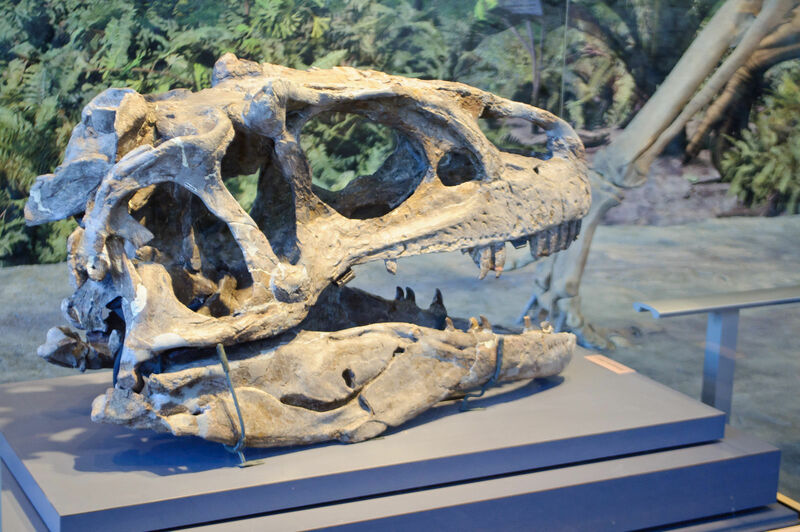 Inside, after being greeted by a 90-foot-long Diplodocus skeleton, visitors can view short films on fossil digs, then chisel away and prepare a dinosaur bone, and travel back in time to explore the Cenozoic, Mesozoic, Paleozoic and Precambrian periods. Just minutes away along Route 40 East lies the town of Jensen, where you can head north to enter Dinosaur National Monument Park. After being closed for several years due to structural damage from unstable soils under the foundation, the Quarry Exhibit Hall is now open and available 7 days a week. Stop at the Visitor Center to meet the ranger, but be prepared to wait. Rangers can only take on car up at a time and during busy seasons, you may have to wait up to 30 minutes. Pass the time viewing a 12minute film, viewing the exhibits and browsing the bookstore. There are plenty of other ways to discover the area, including the 10-mile auto tour, Tour of the Tilted Rocks. This sign-posted road features a scenic trail, along which you can see many petroglyph and pictograph panels, and impressive views of the area’s geological formations. Keep a sharp eye for mule deer, prairie dogs and birds unique to the area. Another auto tour, Harpers Corner Scenic Drive, is a 31-mile route from the Canyon Area Visitor Center to Harpers Corner. Along with striking views from high-elevation roadside overlooks, you can get a good look at the Plug Hat Butte and, toward the end of the trail route, a 300-degree vista with views into the beautiful Whirlpool, Lodore and Yampa canyons. Dinosaur National Monument also has great opportunities for kids to get involved in paleontology, such as the Junior Ranger and Junior Paleontology programs offered at the Visitor Center. After signing up, young explorers receive a booklet of fun activities to complete, whereupon they receive a badge for their achievements. Don’t forget, too, that the park has a wealth of other recreational activities year round, including horseback riding, bicycling, backcountry camping and fishing. Winter is one of the best times to visit because you may be the only ones there with the dinosaurs, offers your family the chance to try snowshoeing, cross-country skiing and snowmobiling. Within the park, whitewater rafting is a very popular way to explore the jagged canyons and ancient rivers. Many of Dinosaur National Monument’s rivers feature intrepid waters and are not for the inexperienced tourist. Rafters wanting a challenge can ride out the Class III and Class IV rapids at sections of the Green and Yampa rivers or take on more peaceful, family-friendly waters at Split Mountain Gorge. Those interested in private boating trips on the Green and Yampa rivers within the park should inquire at the river office. It’s open 8:00am to noon, Monday through Friday and handles the required fees and river permits. However, permits are not required for the Green River between Flaming Gorge Dam and Dinosaur National Monument, or for private boaters on the Yampa River upstream from the Monument. For more information on fees, equipment and experience requirements, visit the Rafting/Boating permits webpage or call the river office at 970/374-2468. 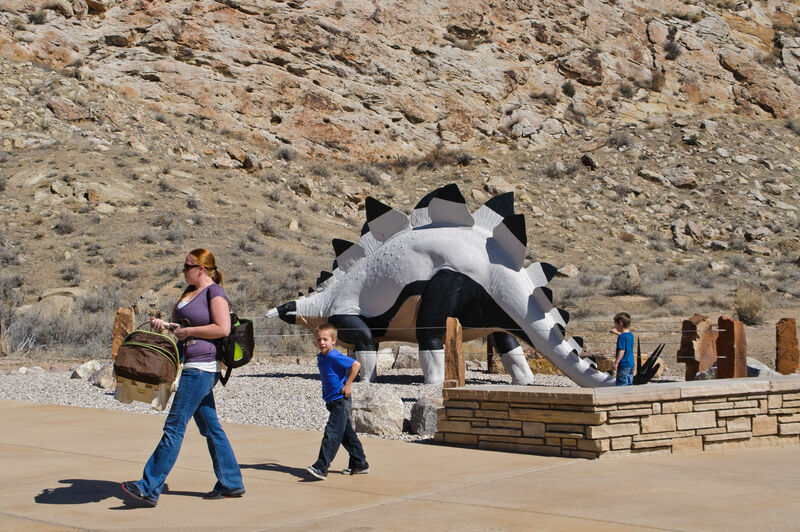 There are an array of hotels in Vernal, Utah for families looking to explore all of the Dinosaur sites in the area. The moderately priced Springhill Suites Vernal is located in downtown Vernal, and is just minutes from the Museum of Natural History, the Dinosaur National Monument, and other tourist attractions. The hotel offers a complimentary continental Suite Seasons Breakfast buffet, high speed internet, and family friendly pull-out sofa beds. Another resource is this listing of Dinosaur National Monument Hotels. For a grittier experience, Dinosaur National Monument has six campgrounds that put you right in the action. However, camping is on a first-come, first-serve basis, so no reservations are necessary. Prices vary for each campground. For more details, visit the Dinosaur National Monument Campground.